world can be needlessly complicated. honest, and high-quality health solutions. "An impressive dessert that's quick to the table, impressive to the eye, and glory to the taste buds! 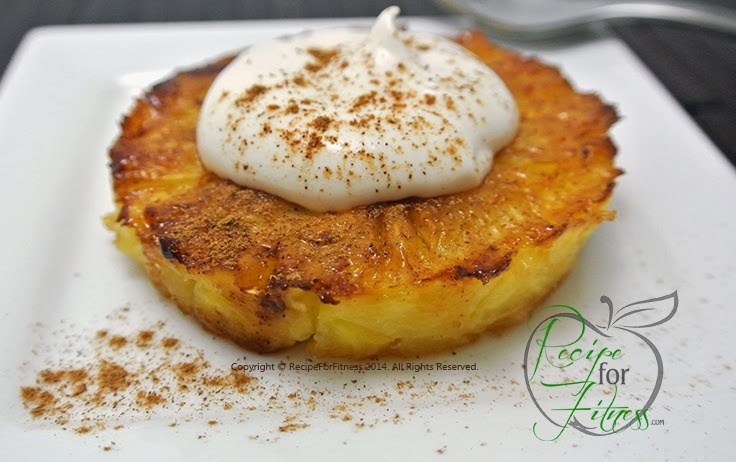 Guiltless Grilled Pineapple with Cheesecake Cream is an addicting tropical treat you can enjoy all year round!" Sprinkle coconut sugar over the tops of the pineapple rings. Dust lightly with pumpkin pie spice. In a small bowl, blend cream cheese, greek yogurt, vanilla, and Truvia-sugar until smooth. Spray grill with cooking oil (I recommend coconut oil). Grill pineapple 2-3 minutes, flipping halfway if using a regular grill. Plate pineapple, then divide the cheesecake cream between the 4 rings. Sprinkle lightly with pumpkin pie spice. You might also be interested in our Gluten Free Peanut Butter Chocolate Chip Skillet recipe.